The anterior cruciate ligaments (ACL) at the front and back of the knee, are the central pillars of the joint and as such, the essential stabilisers. They connect the front top of the tibia (lower leg bone), to the rear bottom of the femur (thigh bone). A rupture of the ligaments causes instability which, if not treated, leads to considerable attritional damage to the cartilage in the knee joint (arthrosis). Clinical and experimental examinations have proven that a damaged frontal cruciate knee ligament will not heal by itself. The femur, tibia and patella are fixed and aligned in a precise way to form the knee joint and support mobility. Misalignment and hyper mobility in the knee joint is caused by rupture of the ACL and accelerates “wear and tear” on the vital cartilage cushions (meniscus) within the knee. ACL rupture in combination with damage to the meniscus, is a threat to the long term viability of the knee. Trauma to the ligaments, especially the ACL may cause osteoarthritis within 10 years of the accident occurring. As treatment methods to preserve damaged ligaments do not usually achieve satisfactory results (torn ACL cannot be simply stitched together), the best chance of avoiding arthrosis, is a frontal cruciate knee ligament replacement operation. 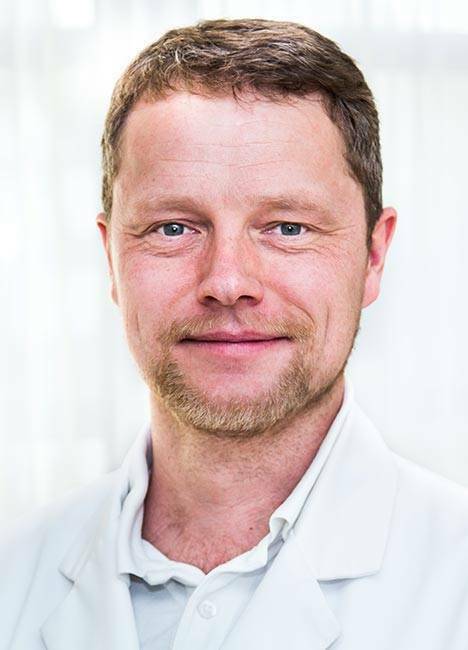 Various comparative studies have shown that the best results are achieved for frontal cruciate knee ligament replacement surgery by using an autologous transplant (replacing the torn or missing ligament by a graft from natural material from the body). The graft can be made from two of the patients’ own semitendinosus (hamstring) tendons (from the leg) or a strip of patella tendon (from the knee). The graft is inserted into the knee joint in exactly the same position as the original ACL, using an arthroscopic technique that leaves only tiny scars and causes minimal post-operative pain. The optimal technique for the patient depends on individual factors. 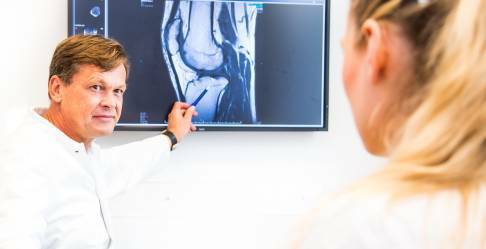 At the orthopaedic Gelenk Klinik these factors are discussed in a pre surgical appointment with a highly specialised orthopaedic surgeon. Following the operation, special rehabilitation measures are put in place to optimise the long term success of the procedure. Through a small incision below the knee, portions of the semitendinous and gracilis tendons of the hamstring are separated from the muscle, but left connected to the tibia. These strips are plaited together to create a section of tendon called an autograft. This autograft will be used to replace the damaged anterior cruciate ligament (ACL). 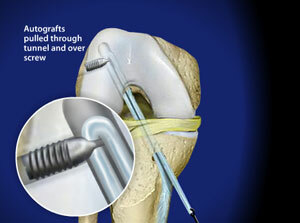 The rest of the procedure is performed through a small incision on the side of the knee. The surgeon uses a small video camera called an arthroscope to see inside the knee during the procedure. With the knee flexed (in the bent position), the damaged ACL is cleared away. Next a pin is inserted diagonally from the tibia to the femur. The surgeon will use the pin as a guide to recreate the ACL. The surgeon drills a tunnel through the tibia and femur, following the path of the guide pin. A second tunnel is drilled to intersect with the femoral tunnel at a right angle and a horizontal screw is inserted. The hamstring graft is looped over this screw and the screw tightly secured to the bone. This forms the new ACL. After the knee is straightened, the loose ends of the graft are pulled tight and held securely to the tibia bone with a washer that has nail-like spikes and a screw. The excess length of the autograph is trimmed away and the knee tested by flexing and extending the knee through it's full range of motion.